Squash House Quilts: Calendar BOM is a Flimsy! Thanks to all of you who suggested ways to sash my Kathy Schmitz Sweet Stitches Block of the Month! As you've heard me mention before, these were supposed to be individual little quilts. I chose to make them one large quilt. I can't believe I finished in under a year, too! I tried several different fabrics as sashings, but not a single one worked for me. Quilt Sue had a great idea - use the same fabric from the center stitcheries! I can't thank you enough for your suggestion, Sue! It was right there in front of me all this time, but it just took a clever quilter to point me in the right direction! 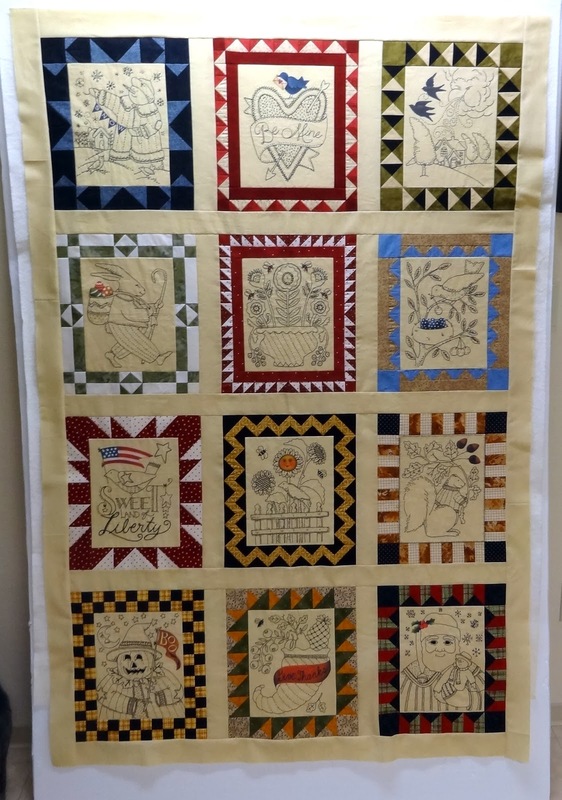 Sue also suggested I make scrappy flying geese around the outside - one fantastic idea, but at this point I am just ready to put this quilt to bed - literally! Sorry for the lighting - I have my design wall in the laundry room. Here is a slightly closer look. I decided to lay them out in rows according to seasons. Sasha wanted to make sure I got her in the picture - she's such a ham! Gracie May is still banned from the laundry room - too many nooks and crannies for her to find trouble, so we'll wait until she's too big to fit into them! I hope all of you in the midwest and east get through the nasty cold! Now that we're retired and don't have to be anywhere, we would sure like snow in our neck of the woods, but we'll have to be satisfied with watching it around the rest of the country. Quilt Sue had the perfect solution. It's gorgeous -- homey, warm, cozy. Although flying geese would look spectacular I completely understand wanting to "put it to bed." :o) Will this hang year 'round or perhaps grace a bed? The brutal winter blast has arrived in Ohio! Your quilt is beautiful Candace! Sue is full of good ideas. Just GORGEOUS Candace !!!! Perfect sashing ! I love it!!! i didn't think I would like them set all together...but now...I may have to reconsider???? Lovely quilt top in progress there. And what a lot of hand work. I don't do much of that. Stay warm and let us see what's up next, okay? Hugs. Sue's idea was perfect and sets off the blocks perfectly. I can't imagine anything that would be as good. It's just beautiful. Congratulations on the finish!! Hugs. Sue's idea was a great solution for sashing Candace. I love how it turned out. 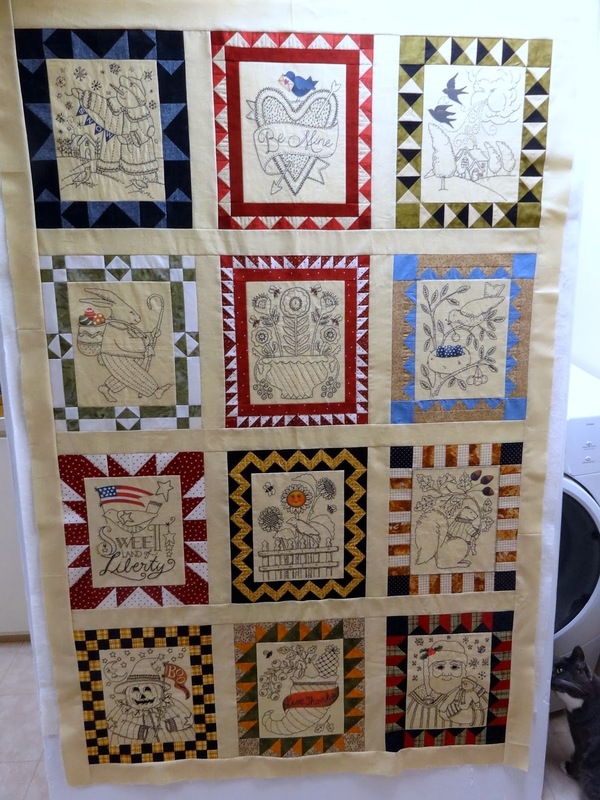 I'm wondering how you quilt a project that is mostly stitchery. Can't wait to see how you finish it. It does look beautiful. I like the plain sashing. Love, love, love it! What a great job, Candace. The weather here was a balmy 40 degrees today, quite a change from the deep freeze of last week. A lot of the snow has melted but we'll back to below freezing temperatures tomorrow. *sigh* Very strange winter! Great idea, Sue. It looks great - I love it. The quilt top is a testament to your talent! You surely do beautiful embroidery! Absolutely delightful, Candace. I have done a few of Kathy's designs. It's always nice to have some handwork in the form of embroidery handy to work on. Anxious to see it quilted! I love your quilt - it is beautiful! The sashing is great! What a beautiful quilt! I love the sashing to set off your wonderful embroidery blocks. The background color you picked for sashing really makes the patchwork and embroidery shine through! It is such a lovely whimsical quilt, Candace! It looks very good. That's a wonderful idea Sue gave you. Well, it's snowing here at last.....too late to save the wheat, I think, but I hope to be wrong. Many may have to re-seed, perhaps, in the spring. Maybe you'll get a bit of it too. Happy finish, that. So nice. Thanks for sharing. LOVE!!!!! What an awesome solution!!! Looks perfect with the sashing!!! Wow, your calendar quilt is wonderful. Congratulations on this wonderful finish. Sew pretty :) This quilt is so much fun and it looks like the perfect quilt for a long winter's nap. Oh it looks so nice. Such a great deal of work. Glad you made it into a quilt. What a Beauty! !